Another visit to an old operator, another small warehouse find.. I recently visited this operator, his father was already in the business of operating arcade machines in the fifties.. their repair man will retire soon after working 40 years for this company. While talking about special machines, he casually mentioned he had some new bowling machines. Excuse me, what do you mean, new ? They don't make these things for 30 years or so ? Well yes, still new in the crate. Really ? Can I see them ?! So we went into the far end of his warehouse and there they were in a corner.. Some electro-mechanical bowling machines. These are already uncrated and used on location. 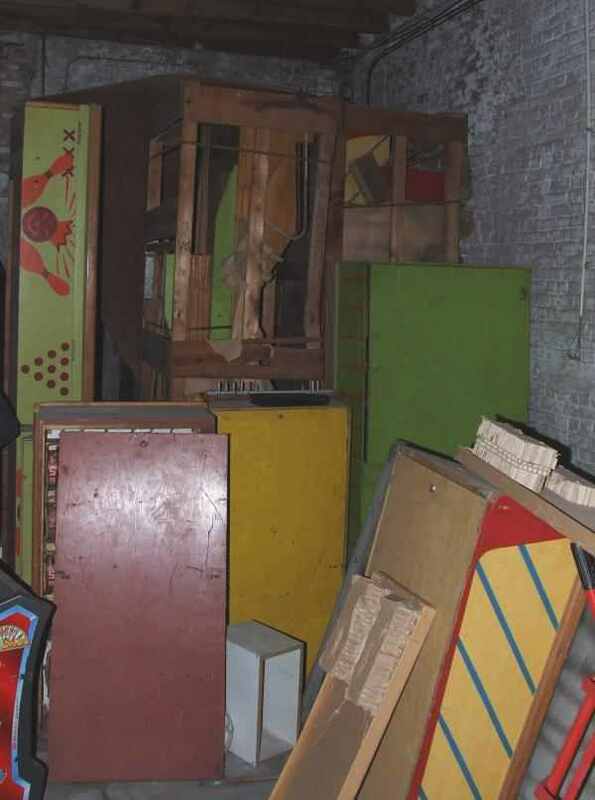 In the other corner: new in crate bowling arcade machines ! As you can see there are three of them. 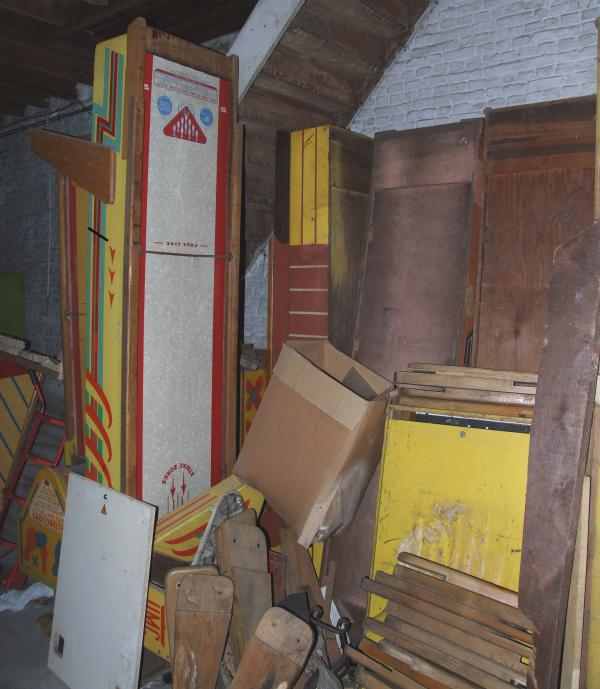 The story behind these vintage bowling arcade machines is that they were held up in customs for a long time.. After a few years this operator was able to buy everything of arcade machines that was held in the customs warehouse, and these machines were part of it. However the popularity of these large machines had dropped by then and there was no use to put them out on location.. so he just stored them for all these years. The green bowlers are United Jumbo or United Royal models. 13 foot, made in 1957. So these machines are over 50 years old ! And no they're not for sale, I asked. 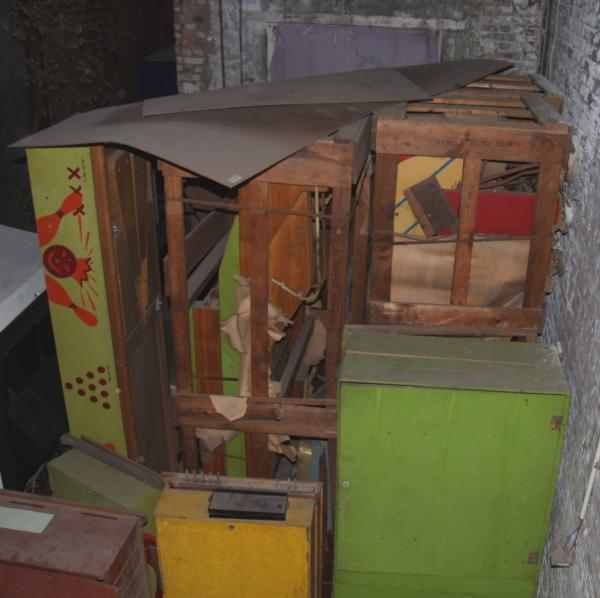 Maybe for a very good offer, but the operator said he doesn't mind owning them as they're probably the only ones in Belgium still new in crate (maybe even in the whole world) and he doesn't need the room so he doesn't need to get rid of them.